Corfe Castle, Dorset, July 1947. Aerial photographs of Britain from the 1940s to 2009 – dubbed the ‘historical Google Earth’ by Cambridge academics – have been made freely available to everyone on Cambridge University Library’s ground-breaking Digital Library. This image from June 1980 shows the construction of the four gates of the Thames Barrier in their final stages. The first 1,500 photographs from a vast archive of almost half a million images went live online this morning (Feb 22), showing not only our ancient landscapes, but also how the UK’s built environment underwent radical change: from the bomb-scarred post-war period, right through to the first decade of the 21st century. 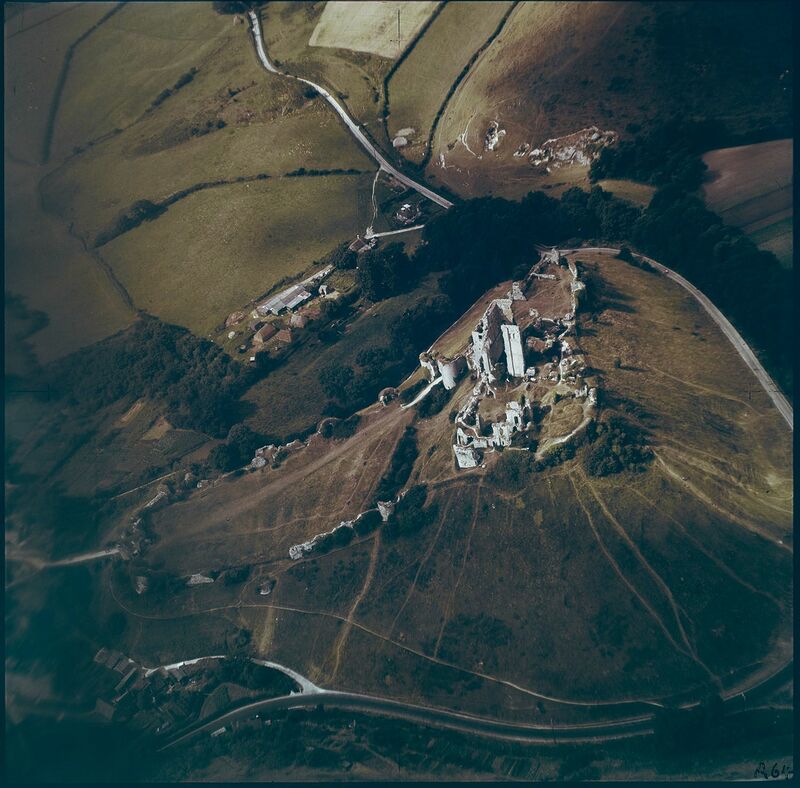 For decades, former RAF pilots – some decorated war heroes – took to the skies of Britain at the instruction of legendary Cambridge archaeologist JK St Joseph in a unique project to map the changing face of the UK via the university’s remarkable Committee for Aerial Photography. The photographs, covering almost every corner of the UK, bring back to life a disappeared Britain and capture the loss of our industrial heritage, the destruction of ridge and furrow landscapes unchanged for centuries, and the emergence of motorways, skyscrapers and modern cityscapes. June 1948 - an early colour photograph of Lynchets on the Dorset coast. “Anyone can go to Google Earth and look at modern satellite imagery – but this is an historical Google Earth that lets you travel back through time to a Britain which no longer exists. “In this first batch of photos, including some very early colour photography, we have cherry-picked some of the best and most beautiful images documenting the changing face of cities, towns and coastlines from all over the UK. The earliest photographs, numbering in the hundreds, date back to 1945 – but the project took off in earnest in 1947 when, over the course of the year, more than 2,000 aerial images were captured. The Committee continued to borrow RAF planes and pilots until the University bought its own Cessna Skymaster in 1965. The Cessna, based at Cambridge Airport (Marshalls), travelled the length and breadth of Britain and helped to capture high resolution archaeological detail from the air; transforming our understanding of UK history over millennia, including medieval England, the Roman occupation of Britain and prehistory. “This is an internationally important photographic collection that is now available to anyone with access to the internet. “St Joseph became a pioneer of air archaeology after his work analysing RAF reconnaissance photos during World War Two and came to realise there was a huge opportunity to use similar photos in archaeology and geology. He chose former RAF bomber pilot, Flight Lieutenant Derek Riley – who had been an archaeologist before the war – to take him on his first trip. The Isle of Dogs, London, 1972. The Department of Geography and Cambridge University Library are now exploring potential plans to digitise the remaining hundreds of thousands of photographs and negatives in the Aerial Photography archive. Tower Bridge, HMS Belfast and the City of London, October 1986. Hill fort, Badbury Rings, Dorset, August 1948. St Paul&apos;s Cathedral and the City of London, October 1986. "We are serious about digitising the entire collection. St Joseph had a vision and this archive is his legacy – we are doing all we can to preserve it and make it available for the next generation. “We are now in the arena of Big Data and an archive like this is totally invaluable in terms of the landscapes and coastlines it has captured over the past 70 years. It’s also an exemplar of what the University Library is doing with digital content. This is cutting-edge work done to the highest standards. The M25 under construction near Thurrock, June 1979. An early colour photograph of Lulworth coast, Dorset, June 1948. Cambridge Railway Station and surrounding countryside, March 1959. The 1,500 images from the Committee for Aerial Photography archive now join other treasures on the Cambridge University Digital Library including the papers of Newton, Darwin, the Royal Commonwealth Society and the Board of Longitude. Cambridge, looking north, north west, December 1981.